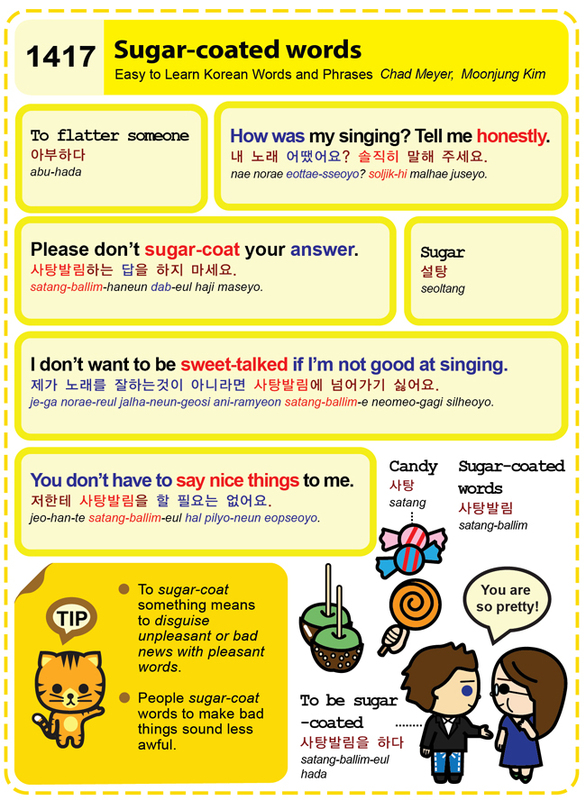 Easy to Learn Korean 1417 – Sugar-coated words. Posted in Series	| Tagged candy, disguise unpleasant or bad news with pleasant words, How was my singing? Tell me honestly., I don’t want to be sweet-talked if I’m not good at singing., Please don’t sugar-coat your answer., sugar, sugar-coated words, To be sugar -coated, To Flatter someone, You don’t have to say nice things to me., 내 노래 어땠어요? 솔직히 말해 주세요., 사탕, 사탕발림을 하다, 사탕발림하는 답을 하지 마세요., 설탕, 아부하다, 저한테 사탕발림을 할 필요는 없어요., 제가 노래를 잘하는것이 아니라면 사탕발림에 넘어가기 싫어요.